Holy Week demands that we dwell in-between. We have been trying since Palm Sunday to place ourselves in the familiar stories of this week, imagining ourselves with Jesus at the supper or in the garden or at the foot of the cross, setting aside our daily business briefly for an imagined role in the drama. We do this, however, as simultaneously self-conscious participants in ecclesiastical tradition, aware, even amid our devotional immersion, that these are all rituals: we know the palm branches will lead to the bread and wine, then to the Good Friday tenebrae candles, then to the processionals of Easter Sunday. We know what’s coming. Holy Saturday is the most in-between place of all, though, because even the scriptural drama holds its breath. There’s nowhere to place ourselves, only silence. The disciples and the women “rested according to the commandment,” says Luke (23:56), and that’s all we know. Jesus is in-between, too, between the burial and the rising, silent in the grave. As Gregory Anderson Love wrote this past Sunday, recent theology has attempted to grapple with the idea that the second person of the Trinity, from Friday afternoon to Sunday morning early, was dead dead dead. How could one possibly ritualize this day, then? The church in its traditions has not directed us to imagine ourselves with the disciples on Holy Saturday, perhaps because one can only imagine them in a state of bewildered despair. They had experienced a wrenching horror and they could not begin to imagine what was coming next. Instead, the church has led us toward Jesus, into that silent place between chapters, and invited us to wonder at the harrowing of hell. The notion that Jesus was busy on Holy Saturday goes back to very ancient sources, as early as the second century. True, getting to the harrowing of hell from the whisper-thin scriptural warrant requires some imaginative speculation. But Tertullian, Hippolytus, Ambrose, Chrysostom, and a pantheon of early theologians took the idea seriously, and it was a standard topos of reflection in the Middle Ages, including in Anglo-Saxon Britain, where the English term “harrowing” originated. The word “harrow,” derived from Old English and dating back to at least AD 1000, has two related meanings. One comes from farming. To harrow is to break up clods of dirt in preparation for planting. One might plow to turn over the soil, but to really churn the crap out of it—or into it, if you want to fertilize—you need to drag a harrow over it. Modern farm harrows are vicious-looking contraptions that churn soil with toothed, spiral blades. Violence is inherent to the other meaning, too: to plunder, rob, spoil. To harrow is to tear a place to pieces, really wreck it up. So the harrowing of hell gives us an energetic, even threatening Jesus, not even resting in the tomb but stepping down from the cross and striding right on to the next task, this one requiring some real farm-hand muscle. This is the same Jesus we saw combatting the Pharisees with deft scriptural maneuvers, the Jesus who tore up the temple in a righteous rage. Descending into hell, this Jesus is ready to wreck the place up. One can see why this idea has appealed to the devout over the centuries. For the more literal-minded, it explains where Jesus’ spirit was while his body lay in the tomb—if you ascribe to the idea that God cannot die in any sense we understand. It also explains how Old Testament saints can be saved into blessedness—they waited in “Sheol” until Jesus rescued them. For the more literary minded, Jesus’ descent into hell corresponds to the archetypal, epic pattern of the hero, who must at some point descend into the underworld as part of his hero’s journey. Perhaps Calvin and his followers were worried, as Steve was, about the harrowing of hell turning Jesus into a William Wallace-style war hero, and there are good reasons for caution there. But I have learned to ponder seriously the psychological and spiritual wisdom of the ancient church, especially when that wisdom persists in the devotion of Roman Catholic and Orthodox Christians today. Why has this Holy Saturday doctrine persisted? I think because we need it. However poetic and allegorical you want to make Jesus’ Saturday adventures, we need to know the theological truth beneath them: Jesus conquers death and hell. 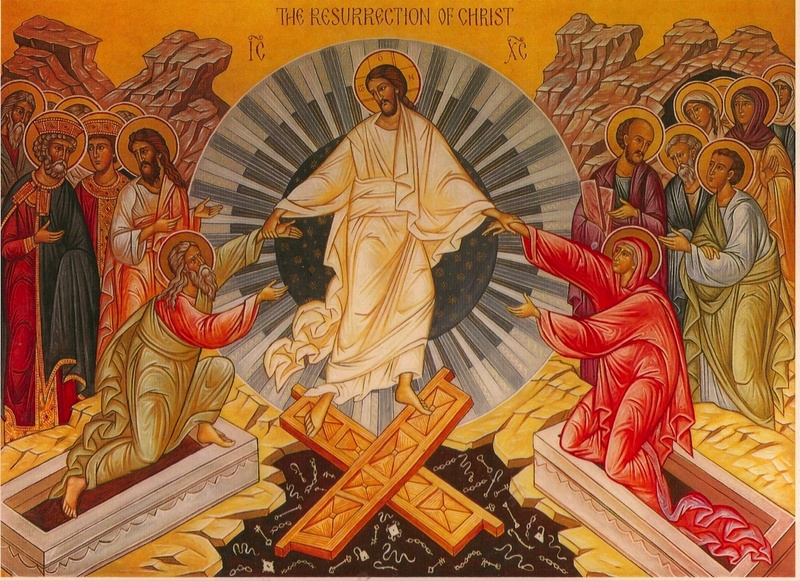 We need to see Jesus as Orthodox icons depict him, standing astride the crossed boards over the abyss, dragging Adam and Eve up by the wrists, “radiant// in spotless white, standing straight, but leaning/ back against the weight of lifting them,” as Scott Cairns writes. We need to see him, “stretching here between two realms,” defying the mouth of hell as it exhales a last filthy breath. We need this because here we are, in between. In between suffering and redemption, pain and hope. I doubt the disciples had much hope on the first Holy Saturday. Unlike them, we know what’s supposed to happen tomorrow. We, at least, have a wobbly hope. But is it real? Are we fools? In this Limbo, are we doomed to have no real hope, only live in longing? Isn’t what we fear most today, every day, that God is silent, doing nothing? We fear, in our Saturday moments, that God is too weak to act on our behalf, or indifferent to our pain, and we are completely and utterly on our own. That no one cares and our suffering is meaningless and inescapable. That our Easter hope is ridiculous. That God is dead dead dead. I think of those who, even after tomorrow, will still be in-between, in this Saturday place: Bud, Clint, Todd, Rebecca, whose bodies have been harrowed by cancer. My father in the nursing home, who every day slides deeper into a living oblivion. All of us, whose troubles and sorrows will not suddenly disappear because the liturgical calendar turns and the lilies appear on the chancel. Believe what you want then about the ontological reality of the Trinity during the time between “It is finished” and the risen Christ’s appearance in the garden. I choose to meditate today on the busy Jesus, the one who crashes into hell and tears the place up, dragging the saints out by the wrist. I’m going to believe that when Jesus takes a harrow to our hearts and our teeth jitter and we feel churned up, the end result is that things will grow better there, and the seed that falls to the ground will rise up, imperishable.